A well designed all-around short that won't break the bank. The Pearl Izumi Pursuit Attack Short features a SELECT Transfer body for wicking, comfort and durability, and a SELECT Pursuit 1:1™ Chamois with four-way stretch, multilevel padding and antimicrobial treatment. Additional features include flatlock seams and silicone leg grippers. 10 inch inseam (size medium). 8 Panels. Features reflective details for increased visibility. Fit true to size. Legs are a little long but I prefer that fit. Don't like these as much as the In-R-Cool Short but they're still good. Don't ride up your legs, tight fit. I have been using Pearl Izumi shorts for years, and always size medium, and I have not gained or lost any weight. These shorts fit like a size large-really a little too large, but I washed and wore them, so now I suppose I am stuck with them. From now on, I guess I'll have to guy my shorts at a shop and try them on first. Love this product for its quality, fit, and compression. Wears well. Never bunches up in the crotch or sags in back on long rides. 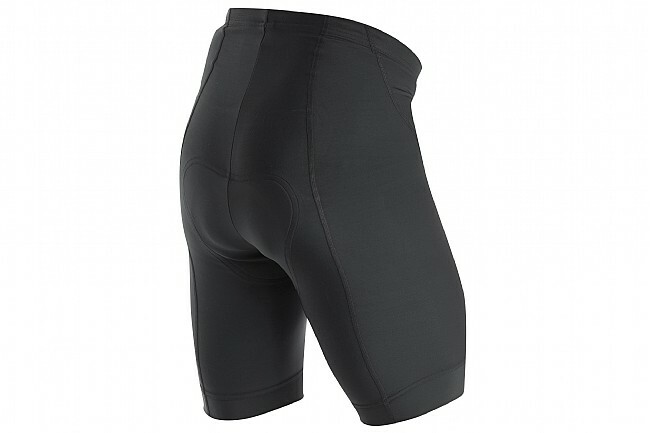 A very comfortable bike short. I've been using the same bike shorts for about six years, and thought that bike shorts were uncomfortable by their nature. This pair of shorts is so much better than what I was used to! I'm very happy with my purchase.